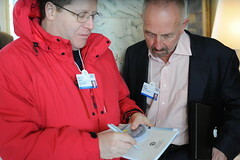 Here’s my people photos from Davos (other photos are now up too). Thank you to Nikon for loaning me a brand new D3 camera, which was really awesome. It shoots in 1/4th the light (two stops) than my Canon 5D, which made many of these photos possible. I made all these images using only one lens: a 50 mm F1.4. 0. Caterina Fake, co-founder of Flickr. Without her none of this would be possible. I just uploaded a second photo of her. 1. Pardis Sabeti, biological anthropologist at Harvard University. 2. Robert Crawford, author. He wrote the summaries for the program. This photo is a testament to the low-light capabilities of the Nikon. If you were there you would barely have been able to see Robert because we were in a really dark bar. 3. Neil Kane, CEO of Advanced Diamond Technologies, talks with John Gage, researcher at Sun Microsystems. 4. Benjamin Zander, conductor of Boston Philharmonic Orchestra. 5. Feng Jim, CEO of Beijing Hual Information Digital Technology Co. He showed me some incredible devices. I posted a video of him earlier. 6. Reza Jafari, head of the ITU. 7. Tim O’Reilly, head of O’Reilly Publishing. 8. Matthias Lufkens, head of PR for the World Economic Forum, talking with Larry Page, co-founder of Google. 9. Eric Schmidt, CEO of Google, talking with David Kirkpatrick of Fortune Magazine. 10. Jeff Zucker, CEO of NBC Interactive. 11. John Markoff, technology journalist for the New York Times (I didn’t recognize him while skiing, naughty Scoble, naughty!). 12. Craig Barrett, Chairman of Intel. 13. Mustafa Ceric, Grand Mufti of Bosnia (top religious leader). 14. Steve Forbes, CEO of Forbes. 15. Yo Yo Ma, famous cellist. 16. Richard Edelman, CEO of Edelman, world’s largest PR firm, talks with Larry Brilliant, head of Google Foundation. 17. Queen Rania of Jordan talks with Lee Bollinger, president of Columbia University. The Queen is the only person that I saw stop a room when she walked in. 18. Lee Bollinger talking with Richard N. Haass, President of Council on Foreign Relations. 19. David Gergen, political commentator. 20. Yossi Vardi, Israeli venture capitalist, talks with Shimon Peres, Israel’s President. 21. Mark Zuckerberg, CEO of Facebook, hangs out with Phillip Rosedale, CEO of Linden Labs (the folks who bring you Second Life). 22. Pervez Musharraf. President of Pakistan. 23. Congressman Brian Baird (Washington State). 24. Dan Shine, vice president at AMD. 25. Nicholas Negroponte. Head of the OLPC (One Laptop Per Child) project, among many other things. 26. Patrick Aebischer. Famous neuroscientist. 27. Larry Brilliant, head of the Google Foundation. 28. Elie Wiesel, Nobel Laureate. Real honor to meet him. 29. Meghan Asha and Mike Arrington. I got a photo of Meghan giving her editorial opinion of Mike. 30. Gerhard Florin executive at Electronic Arts talks with John Markoff, tech journalist for the New York Times. 31. Alexander Straub, CEO of Truphone. 32. Brenda Musilli. She is Director of Education for Intel and President of the Intel Foundation. 33. Reza Jafari. Head of ITU. 34. William Brody. Head of Johns Hopkins University. 35. J. Vasudev. Founder of Ishafoundation. 36. John Maeda of MIT. Famous graphic designer. 37. Ellen Langer. First female tenured psychology professor at Harvard. I have a second photo of her here. 38. Bob Lessin. Interesting guy, was a vice chairman at Smith Barney before he had a stroke here’s a Fast Company article on him. 39. Bono and Al Gore. 40. Al Gore making a point. 41. Mabel van Oranje (princess of Netherlands) talks with Robert Shriver who runs Bono’s Product Red Initiative and Richard Lovett, head of the Creative Artists Agency (Hollywood’s most powerful talent agent). 42. Michael Spence. Nobel Laureate/Economics. 44. Reid Hoffman, CEO of LinkedIn. 45. Mitch Kapor. Chair of the Open Source Applications Foundation. 47. Jonathan Rothberg, genome researcher. 48. Condoleezza Rice. United States Secretary of State. 49. Chad Hurley. Co-founder of YouTube. 50. HTC’s Chairwoman, Cher Wang. 51. William Amelio. Lenovo CEO. 52. Randall Stephenson. AT&T CEO. 53. Marc Benioff, CEO of Salesforce.com, goofs around with Loic Le Meur, CEO of Seesmic. 54. Jeff Jarvis. Famous blogger. 55. Tariq Krim, CEO of Netvibes, talks with Mike Arrington. 56. danah boyd. Social networking researcher. 57. Esther Dyson. Famous technologist and sticker collector. 58. Linda Avey. Founder of 23 and Me. 59. Tim Brown. CEO of IDEO. Whew, that’s a lot of photos of interesting people for one week. Whenever I see photographers / artists who are precious about their work being used (especially without credit) I wonder about how they would rate themselves regarding life / carreer progression. Does one really need credit / attribution for the furtherment of one’s art? Or is it more to do with recognition or financial gain? Salubri: well, on the other hand it’s nice to see artists and journalists getting paid. I just choose a different model for getting paid, that’s all. you can’t tell they are in the public domain from the Flickr image – you’ve used the least restrictive CC licence but under that you still maintain ownership. Pretty sure you’re going to have to state on each image what you are doing. Although I actually think leaving them attribution needed is better. Interesting that I count 11/59 women in your selection. I wonder if that is indicative of the general Davos balance? Rachel: true, I went with the loosest license that Flickr has. But this note here would legally hold up and will cover all my photos. CharlieM: yeah, the male/female ratio is something like that there. i have the 50mm F 1.8. those lenses are truly amazing, and the build quality is far superior to the canon equivalent. especially, for the cheaper one. jonas: yup. That actually is true of every lens: they are usually about 30% sharper when stopped down mid-way. Wide open or all the way closed are least sharp. Some lenses this is worse than others, though. Perhaps that is because the lens on your 5D is two stops slower than the 50mm 1.8 on you Nikon? So, your comparison between the two camera bodies appears somewhat misleading when you should, instead, be comparing the lenses on the two camera’s. I gave you full credit and linked it back to your Flickr account. Having photos like this, easily available, really adds to the quality of blog posts. Why public domain and not CC attribution? Or perhaps share alike so derivatives are also free? Interested to know your reasoning. Do you think CC isnt viable? Robert, you have 2400+ pictures in your Flickr stream. That’s crazy. That’s how you drive interest. Are there any legal ramifications of putting up photos of other people? Aka, do you have the right to release them into the public domain, or do you need some kind of model release? Robert, I’m watching CrankyGeeks right now and I have to say, I love you! You are a real web 2.0 hero. Rich: I have the same lens (an F1.4) on my Canon. The Canon shoots at 1600 ISO at the same quality the Nikon shoots at 6400 ISO. And anyway a 50 mm F 1.8 is only 2/3rd of a stop slower than a 50mm F1.4. fortes: you do NOT need a release of your subject to put them into public domain. The only reason you need a release from a subject is if you’d like to use them in advertising where their use might imply an endorsement of the subject. Professional photojournalists never get releases of subjects they take in public places, which is where I got all of these photos. moo: because I don’t care if I get attribution or not. I want to give you the right to use my photos without doing anything for me in return. Scoble, none of these photos are in the public domain. You list a CC license on all of them that requires attribution. By labeling your images this way, you are imposing this license restriction on them. You should remove the CC license if you intend for them to be public domain. Andrew: I can’t figure out how to do that in Flickr’s UI. If I change the license to “none” then Flickr says “all rights reserved”, which is the opposite of what I actually want to do. Flickr doesn’t let me mark them with a public domain, so I picked the loosest license I could find. The second problem is more serious. While you can grant free use of your photograph, the subjects of the photograph have something to say about the use of their image. This is especially the case if a commercial use is made of the photograph. Unless you have model releases, and say what they are (they usually have to be in writing) your copyright license is important but insufficient for someone to do whatever they want with the image. I bet you know something about that from your work in a camera shop. Nothing has changed. That list is simply impressive. I wouldn’t have guessed that World Economic Forum draws that kind of roster… A surprising amount of tech people participated i.e. not all were political leaders or economists. Let’s be clear about something. You can only make a quite claim to rights that you have. Not to rights that you don’t have. Your copyright in a photo does not include a right possessed by the subject of the photo and not you. That’s why there are separate releases. I am not disputing that the rights of people to their own image is diminished in public activities, but your making a public domain declaration is independent of that and people who use your image need to be just as careful as someone who purchases it from you. Orcmid: that is true. If you want to use these images in an advertisement you need additional permissions. But you don’t need to get mine. Tomi: everyone except me was interesting at Davos. It was like being a kid in a candy store. My only regret? That I couldn’t meet all of the 3,000 participants. Robert, fantastic work in capturing this historic summit. It’s great to see the work made so freely available and adds greatly to the historical record of the event for generations ahead. You know, I glad I’m not in the publishing business cause the copyright and useage laws are pretty detailed. But, I think in this particular case, where Scoble shot these people in a public forum as news worthy items the images can be used for such purposes. Problaby can’t use Bono’s image shot there for a beer advertisement. But as a blogger I could use the image in my blog where I’m discussing something in reference to him. But I think the fact is Robert has given everyone permission to use the images without compensation to him, which isn’t the same as saying “use this image any way you want.” Scoble doesn’t have that much power, YET. Do you realize that the majority of photographers / artist who are hammering home the importance of being credited and rewarded for their work do so because they are trying to make a living from them. While it is great that Scoble makes his photos available for free use I doubt he would do the same with his book “naked conversations”. (Robert if you do change your mind about that send me a PDF copy to my email address). What an incredible amount of brain power Davos assembles. I hope there are some outcomes, other than the “rich and famous” socializing with each other. Do you see an opportunity for something to really happen? All my photos are in the public domain now. Bravo, Robert! Thank you, thank you, thank you! Very nice demonstration of your viewpoint Robert! For those who seem to find the idea of the public domain ghastly, take a look at SQLite. SQLite has done a lot of good for developers over the past several years, and is totally in the public domain. Even Apple use it to power their Mail app. I release most (though not all) of my software, libraries, and similar contributions into the public domain, except for things I actively make money from, because I want to make the world a better place (and I don’t care much about global warming, so I do it in other ways!) Scoble is to be applauded on this move, not questioned, because what you sow, you tend to reap further down the line. Also, Creative Commons do have a public domain dedication. It’s just that Flickr doesn’t use it for some reason. Peter: good point. Any photo used for commercial purposes (which both of those examples you used do) should have model releases. It is a pity that Flickr doesn’t offer a Public Domain option for photos. But I’m sure that would open up the likelihood that many people would release stuff into the public domain without understanding what that means, and in some cases without the rights to do so — as already happens with CC licenses. Robert – thanks so much for releasing these photos! On the Wikimedia Commons, public domain shots of people do (or should, in any case) include a note that although the *copyright* is free, personality rights, etc. may well not be. Even public domain pics should have source, etc. on the photo page where known, because it’s relevant and useful information. Hi Robert…..well….what a privilege it is to be exposed to such a diversity of genius, in the birthing room of global change. I was wondering if you can help with a website for Beijing Hual Information Digital Technology Co. When I search it, all roads link back to you, this post and flickr! What a privilege it must have been to meet with such a diversity of genius in the birthing room of global leadership and change? I was wondering if you could help me with a website or address for Beijing Hual Digital Information co? A search only leades me back to you, this post and Flickr? It’s only recently that I’ve started following your blogging/posting/twittering/etc but have enjoyed all the things I’ve seen, heard, and learned from you. I have a quick question. I want to use your photos posted on Flickr for commerical use. Are they available for that purpose? I read that they were; however, I also noticed that there are restrictions on their usage. You are welcome to use my photos. If you need to have further permissions or clarifications, please email me at scobleizer@gmail.com. Thanks! Do you happen to know anyone else that should be added to the list? The Wikipedia article called “List of notable people who dedicated works to the public domain” was deleted by a Wikipedia administrator.